Ideas for showstopping birthday desserts. Birthday cakes and sweet treats are a fun way to celebrate someone's special day, but they don't all have to be so elaborate. For your next birthday celebration, I've put together some tips so you can create the perfect cake! If you want a simple cake with white icing, consider having a surprise inside. Prepare a yummy vanilla cake recipe and split the batter into five bowls. Color them red, orange, yellow, green, and blue. Bake them separately so when you stack the layers of the cake you have a beautiful rainbow. Your kids and their guests will love the surprise when you cut into the cake. If you don't have much time or haven't had much experience in the kitchen, pick a simple idea and stick to it. Cookies are a great substitution for cake. In a pinch,or as an alternative, buy some ready-made sugar cookie dough and add your child's favorite flavor icing and top with sprinkles. Who doesn't love fresh baked cookies? Candy pieces, chopped candy bars, or plastic cake toppers, in place of handmade characters and designs out of fondant. Many party stores carry premade letters and shapes to top cakes and cupcakes, as well. 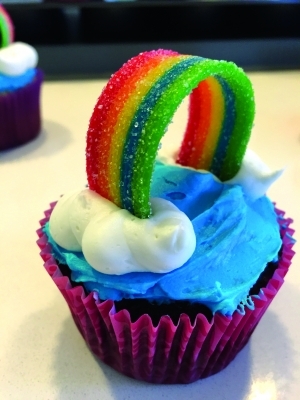 If your daughter loves My Little Pony, use rainbows on your dessert to tie everything together. Let them help mix the cake batter and decorate their cake or cupcakes. It will not only be bonding time with your child, but introducing them to something they may not have experienced before. Even if you aren't the next best cake artist, have fun with your kids in the kitchen. They will be proud of their work when everyone sees their special birthday dessert. Flowers, princess fairytales, woodland creatures, and ballerinas are some of the themes that might inspire you. Keeping things simple, like these colorful flower cupcakes, will make little girls and her guests light up! Popular party themes for young boys include trucks, sports, pirates, superheroes, zoo animals, policemen, and firemen. Make his day special with an easy homemade cake, like the one above. He'll be sure to have fun with his friends while celebrating. Always supervise children around electric appliances, sharp knives and hot surfaces in the kitchen. If you have a big family, you may be celebrating multiple birthdays at once. To please everyone, try making some birthday-themed treats with a twist. A giant cupcake cake always brightens a child's face when they see all the icing and giant sprinkles on top. Another sweet idea is to whip up your favorite batch of cupcake batter and bake it in ice cream cones. These cute treats can be topped with icing to look like an ice cream cone including chocolate syrup, sprinkles and even a bright red cherry. Make sure to preheat your oven. Use room-temperature ingredients, even your eggs and butter. Bake your cakes on the center rack of the oven. Spray your pans with nonstick backing spray. Let your cake cool slightly before removing it from the pan. Margaret Baldauf is an art director at PARENTGUIDE News and a cake artist. For more sweet ideas and inspiration, follow Margaret on Instagram, @mbcakedesign. Photos courtesy of MB Cake Design.